Human sacrifice and an impending apocalypse sure can throw a wrench in the holiday season. Ruler of Demons ($13.95, 214 pp., ISBN: 978-1-60381-905-3), by Scott A. Lerner, is the sequel to the urban fantasy thriller, Cocaine Zombies, which won a Bronze medal in the 2012 IPPY Awards. “There are exciting twists in the fast-placed plot that raise the stakes for our heroes. Ruler of Demons doesn’t feel like a horror story, but there’s strong tension and entertaining banter throughout the book. It’s the only novel about demons, mutilation, and the apocalypse that can potentially leave a smile on the reader’s face.” Read more …. “A FUN book! The main character has a really cool sense of humor (even if he is a lawyer) and even when he is about to get killed he doesn’t completely lose it. The book does have its dark side but on the whole it is the sort of book you should read when the weather is bad and you need cheering up ….The mystery part of the story was really well done too. You really don’t know right up till the end exactly how it will go. Every time I thought I had it figured out…some other thing got thrown in to shake things up.” Read more …. 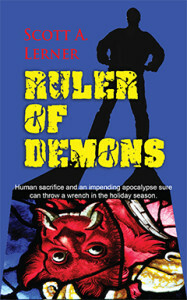 “Ruler of Demons is creepy and fast-paced, with a few thrilling twists to keep the reader up at night. It’s also sprinkled with the kind of humor one hears in a police procedural show, the wisecracks one imagines veteran cops make. They may not be the most realistic bits of dialogue, but the blurb on the back cover gives a good idea of the wild-ride tone of the novel: ‘Only eleven shopping days till Christmas. And less than a week to save the world.’” Read more …. “The novel is jam-packed with details from TV and movie references to mouth-watering descriptions of local cuisine. Lerner has a keen eye for the world his characters inhabit making it come alive for the reader in all three dimensions. Overall, the mystery aspect is intriguing, but it’s the banter between Sam and Bob that holds the book together.” Read more …. “Ruler of Demons is well written, with plenty of humor and plenty of adventure and Lerner’s cast of characters are intriguing and intelligent. Readers who like a bit of weirdness and darkness in their reading (kind of like my oldest son!) will adore this.” Read more …. “Sam’s a fun character who inhabits a world full of them. Their interactions are natural and entertaining and the tension builds nicely as the book progresses. I found myself anxious to see how it all turned out and ended up reading it in a day. I recommend this for anyone who likes a good mystery with religious overtones.” Read more …. “One of the best techniques in this thriller is the pace. Your heart will race. But you won’t have a heart attack, because the author is skilled in breaking up the pace with humor. Sam’s and Bob’s banter will make you laugh. Sometimes you have to stop and think, and then you’ll guffaw…. They’re clever, witty, and likeable. I think everyone will enjoy this story. You won’t figure it out. You won’t expect any of the twists the characters find themselves going through. You won’t want the world to end.” Read more …. “The changes in location help place the novel in the religious and historical framework that Lerner constructs. An archeological site in Israel grounds the story in antiquity. A French farmhouse built on the remnants of a Catholic church adds a spiritual element. The rooftop of a Chicago skyscraper brings things back to the modern threat that evil poses complete with an elaborately constructed altar. All of these settings combine with a protagonist who is more of a suburban atheist than anything else. Sam’s belief in logic and living in the now directly opposes the nature of the crimes he’s trying to solve, giving the book an added sense of tension as the reader is forced to look at things from the outside in…. RULER OF DEMONS might not be bursting with peace on earth and yuletide cheer, but for the murder mystery fan who gravitates toward the macabre, it makes the perfect stocking stuffer.” Read more …. Only eleven shopping days till Christmas. And less than a week to save the world. Three nuns—in Chicago, Paris, and Jerusalem—have been killed in a religious ritual. The choice of victims and the macabre details of their deaths indicate that someone is following a recipe provided on an ancient text—a recipe to unleash the forces of hell on earth. The final sacrifice must occur on the Winter Solstice. Samuel Roberts, a small-town attorney in Urbana, Illinois, knows a bit about the supernatural, having triumphed at least once over the forces of evil. Thanks to a friend who is aware of Sam’s little known previous efforts on behalf of mankind, Sam is hired by a big Chicago law firm to take on a sensitive case. His mission? Nothing less than halting the impending apocalypse. Sam and his good buddy Bob travel first to Jerusalem then Paris in a desperate race to save mankind. Author and attorney Scott A. Lerner resides in Champaign, Illinois. He obtained his undergraduate degree in psychology from the University of Wisconsin in Madison and went on to obtain his Juris Doctor degree from the University of Illinois in Urbana Champaign. He is currently a sole practitioner in Champaign, Illinois. The majority of his law practice focuses on the fields of Criminal law and Family Law. Mr. Lerner lives with his wife, their two children, and their cat Fern. Lerner collects unusual antiques and enjoys gardening, traveling, reading fiction and going to the movies. You can find Scott online at Scottlerner.camelpress.com. I turned the knob to my front door to find it unlocked. I don’t always remember to lock my door so I was not overly alarmed. On the other hand the dead bird combined with the unlocked door did put me on edge. Since my last supernatural entanglement, I had begun to leave a Louisville Slugger in the umbrella rack by the door. I slowly opened the door. Nothing appeared out of place, but I grabbed the bat and slowly made my way through each room of my house. I found no sign of intruders. I decided it was safe and put the bat back where I had stashed it. It was almost seven-thirty and I had still not eaten. Not to be critical, but the wake could have used some snacks and Irish whiskey. I thought about cooking some traditional Irish delicacy in honor of Mrs. O’Neill but the closest thing I had in the kitchen was a year-old box of Lucky Charms. I kept meaning to get to that. My fear of refrigerators had mostly dissipated over the last year, and I decided to risk a roast beef sandwich. I opened the crisper bin and gathered a container of roast beef, some sliced sharp cheddar cheese, and some Grey Poupon mustard. I placed them on the kitchen table. I was about to retrieve the sourdough bread from the bread box when something caught my attention. In the middle of the table was a silver pocket watch case. I do have a number of watches, but I don’t store them in the kitchen. I also don’t own a pocket watch. I picked up the case. On the front was an engraving of three stalks of wheat. The kernels where plated in gold. Behind the wheat was a large cross, also in gold. This case was expensive and well made. If it had been left here by a robber, then they didn’t fully understand their job. I sat down and pushed the button attached to the neck of the case. When the case opened, I immediately recognized my error; this was not a watch case but a pyx—the silver case priests hold the host in. I understand that the host is supposed to transform into the body of Christ once ingested, but not until it is placed in the mouth. Inside the case was a puddle of blood. The blood surrounded the tip of a severed tongue like a tiny moat. Some evil force was trying to get me to lose weight by making it so I would never enter this room again. Then and there I decided I would rather dine out for the rest of my life than risk facing another body part in my kitchen. I had been sitting in stunned silence for a golden moment when the telephone rang.